Reposting our Playground Memories from our old blog. In 2011, we covered 7 old-school playgrounds over a period of two months. Sadly some playgrounds has since been torn down…. We are featured on Channel U’s 100% Singapore ! Daddy found this interesting article on Friday’s (07-Jan-2011) Straits Times Life section. He saw seven 30+ years old Playgrounds! We got inspired, and ## Project Playground (PP) was born. Our Old-playground project is not only dedicated to the kids, but also to everyone who is young-at-hearts 🙂 Yes, you!! The boys and girls born in the 70s and 80s. Feeling Nostalgic already? Kids start climbing the stairs and the Dragon’s guts. Boys, do you realise this playground is nearly as old as your Daddy? On hindsight, Daddy should arrange smallest one behind.. Sliding with Sengkangbabies are never boring ! Yi got angry keke. Video : Even Daddy could not resist the slides ! How many kid have fond childhood memories of Dragon? When will people start taking care of their own playgrounds and backyards? 2) As part of 2011 M1 Singapore Fringe Festival (arts), School of Hard Knocks had showcased their “playgrounds-collection” captured over the last few years. 3) The original playground blogger Justin Zhuang –> http://justrambling.sg/?p=1105, click to start navigating with his GPS playground map. 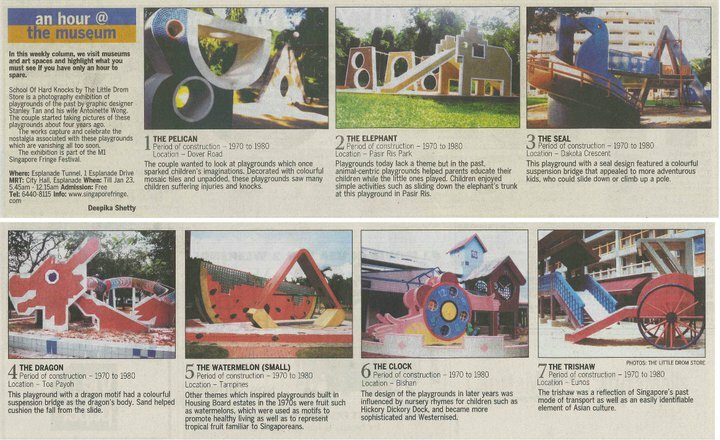 Follow our links to explore Singapore’s oldest playgrounds. More photos of Old playgrounds!